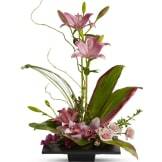 This towering topiary of asiatic lilies, orchids and roses — artistically arranged with tropical greenery — is a unique gift that celebrates the the memory of someone special. • Pink asiatic lilies rise up from a square design block holding a mix of cymbidium orchids, spray roses and accent blooms and greenery. • This arrangement measures 18" W X 27" H.